Another season has come to an end, a season filled with highs, some lows, new adventures and lots of things to work on in order to come back stronger next year. The second half of the season has gone by like a whirlwind. It’s hard to believe that April is already upon us. Now that I am back home in Whitehorse, I have some time to relax and reflect on the year. After some exciting World Cup racing in January, February brought another season highlight when I finally qualified for the heats at the World Cup in Lahti, Finland after 3 previous times sprinting in Lahti. After getting a bit closer each try, I was very happy to be able to execute a very good qualifier and ski well in the quarterfinal to finish 24th. At the end of February, I competed at my second World Championships. This year World Champs were in Seefeld, Austria. The venue and fans made for an amazing atmosphere with the stadium nestled beneath the beautiful mountain backdrop. Going into the championships the sprint was one of my main focuses. I came away from the race disappointed and frustrated that I wasn’t able to ski a qualifier I was happy with regardless of the result. The race I skied that day was not my best of the year, far from it. It was not my worst either, however at the World Championships everyone is looking to perform at their best so there is no room for error. Needless to say, to miss out on the heats by only 0.02 of a second and finish 31st was heartbreaking. Overall my championship gave sub par individual performances, I was able to find that next gear for the team events and was able to prove to myself that all was not lost for the remainder of the season. The relay at World Championships was the highlight for me. I skied the anchor leg and was able to move the team up from 14th up two places to finish 12th. I was able to push the whole race and dig deep mentally. I knew when I crossed the line, after sprinting the last 1km to pass the Polish team 200m before the finish, that I had given my all for Canada that day. Looking at the results later and seeing that I had skied the 6th fastest time on my leg left me with a smile. A good reminder of what I am capable of even though these World Championships were far from what I had been dreaming of. Anchoring Canada in the World Champs relay. Racing leg two of the World Championships Team Sprint. After World Championships I had the chance to come home after two and a half months of racing and training in Europe. The mental and physical reset was a much-needed break before the final month of racing kicked off in North America. Backcountry birthday ski in Kananaskis Country to re-energize before the last month of racing. Canadian Nationals were at Nakkertok Nordic this year. I was glad to be able to attend nationals this year after having missed them because of scheduling conflicts last year. With nationals being so close to Ottawa, it was special for me to have my grandparents in attendance for the races. My grandma and grandpa came to watch my first Nationals in Duntroon, Ontario in 2009 so it meant a lot for them to be able to be on the sidelines cheering once again this year. The week brought some fun racing and another National title, which is always something to be proud of. It was also filled with many opportunities to interact with the younger Canadian club athletes. It is very inspiring and motivating to see the drive and determination of these young athletes. Post race poster signing and photo sessions. The final World Cups of the season were on home soil. A home world cup was the perfect way to cap off a busy world cup season and to celebrate the retirement of Alex Harvey and Lenny Valjas. The atmosphere in Quebec City was electrifying and the crowd was full of emotion as they watched Alex win a silver medal in the final race of his career. Lenny and Alex have both been great mentors, role models and friends and it will be very different next season without them there. My season wrapped up at the Super Tour finals in Presque Isle, Maine. The World Cup finals in Quebec were not my best races of the year and I was starting to feel the fatigue of the long season. It was really gratifying to be able to fight hard and finish the season with two really good races in Presque Isle. 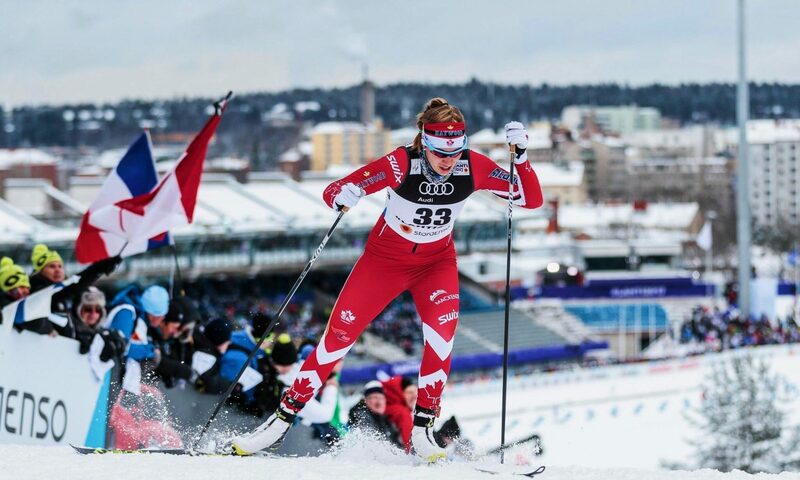 With a fourth place in the sprint and a 3rd place in the 10km classic mass start, both races brought some very competitive racing opportunities and tight fought battles from start to finish. I went to the Super Tour Finals looking for some fun racing to end the season and the chance to push myself all race against skiers of very similar ability. I found just that and a bit more; my first Super Tour distance podium in what was probably my best distance race of the season and my best classic distance race in many years! I did not achieve all my goals for the season but there is no questioning that this season was my best yet. Placing 16th in the World, moving my overall world cup ranking up to 44th, finishing 31st at the World Championships, becoming National Champion once again and bringing my classic distance racing back to an internationally competitive level. These are all solid building blocks for me to draw on this spring as I begin to plan and create the foundation for the next race season. All of these achievements wouldn’t have been possible without my amazing family, friends, sponsors and coaching staff. The best cheering squad! Dad, Grandma and Mom cheering me on at the World Cup finals in Quebec City. Thank you to everyone who have supported me this season! A very special shout out to Proskida, RyanWood Exploration Inc., Icycle Sport, Buff Canada, Capital Helicopters and Alkan Air for helping fund my travel, training and racing this season. Without the support of these wonderful local companies I would not be able to pursue and reach my skiing goals. Your support means the world to me, thank you! Wishing everyone a wonderful spring!